I'm pleased to take part in this wonderful photo series started by Trishie at Under Lock and Key. The theme for February is "something romantic." Romantic to me is the dreamy flutter of delicate flower petals against one another especially in shades of pink. These beautiful pale pink colored chrysanthemums beckoned to me as they sat outside a corner deli on West Broadway in New York City. Of course I just had to take them home with me after snapping this photo. What flowers or qualities of flowers do you find romantic? Floral Fridays is a monthly photography project with different themes each month. This series is about fun and taking time out to smell the flowers. To play along, please email Trishie for next month's theme. And please visit my fellow participants below for more floral inspirations. Beautiful pink chrysanthemums and I love pink flowers. Great pictures love flowers I call them accessories for the home. Nice post doll have a great weekend. This is probably my favorite color! Awesome photo, Rowena:) I love pink. Beautiful flowers! Happy Friday hun. SO pretty. I adore pink flowers. Have a lovely week doll!!! I don't even know which flowers I find romantic. To be honest, I don't know most of the flowers names in English, so I wouldn't be able to tell, but I do love those pink flowers in your picture above. They certainly look romantic to me. This photo is so beautiful, the colour of the flower is really pretty. Great idea! Hope you have a wonderfully relaxing weekend! Those are some pretty pink mums! the photo is just amazing! love how you could really see the different shades of pink in this pic! that's a great project. gorgeous flower! beautiful color. have an amazing weekend rowena. thanks for the compliments. What a fun post and I am starting to love floral - especially fresh flowers. I just posted about floral print yesterday so I had to enter the blog hop. Looking forward to checking out the other bloggers too. The photo is beautiful, Rowena! I love the little bit of the blue/green wall behind peeking through all the pink. I've totally given up on Insoon is Pretty and the one about a Flower Boy Band (I heard a good review of that one but didn't enjoy the fist episode at all so I stopped). I think Choi Jin Huk is adorable when he smiles but I watched about 10 minutes of Emergency Couple and he only smiled once. He was like that in Heirs too, mostly angry or brooding. It's crazy the amount of INR 3 flashbacks. I guess that's the signature of that series. What a cool idea! I am attending the Phillie flower show next month for my blog and will be happy to see colors and flowers galore! This snow is really just getting to be too much! Keep warm this weekend!! They sure are sweet and romantic, Rowena! Love the pink color. Have a great weekend. so sweet , great idea! Love this post:) Amazing picture as well! Nice to see a pop of color. I shot some tulips today, so I'll be posting soon. Ah what a brilliant photo, and I bet these caught your attention, a lovely pop of pink in the grey of New York. This is a fun series! So beautiful! hope you are having a great weekend. You took a splendid picture Rowena! Definitely romantic, delicate and girly. This is a beautiful idea. Such pretty pictures. PS Love your radiant orchid post too, want all those pieces. What a beautiful series. I love your photo. chrysanthemums in pink are just so beautiful! Ooh, love this photo. It definitely evokes a sense of romance. I love how delicate and light the flowers look. Flowers are so beautiful and delicate that I can't help but tie them to romance. Love this series you're doing! Pink perfection. I love your flowers! Lately I've been into tulips, I think they are so romantic in the spring. 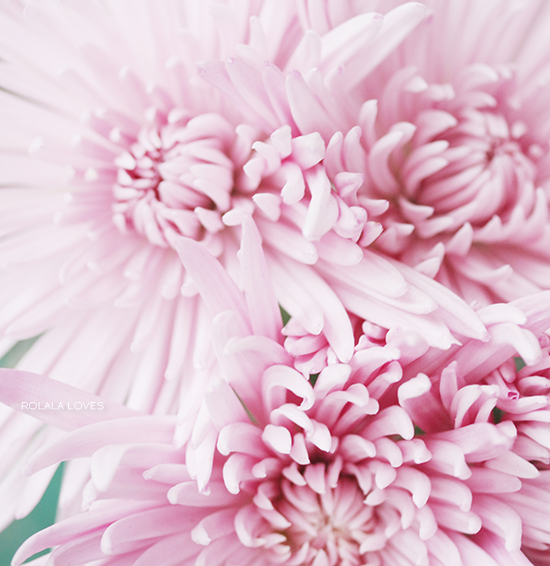 Who knew pink chrysanthemums can be so dreamy and romantic!! This picture is just amazing! Yeah you're right stacey! That photo is really beautiful.